Pfaff embroidery machines are one of the most effective tools invented by man. With these, one would not have to sew their clothing by hand alone or buy hand woven products, which usually cost much. A housewife would not have to spend too much time sewing or repairing the clothes of her family and spend more time on more worthwhile things instead. Pioneer in making top of the line sewing machines is Pfaff. Pfaff sewing machines are always ahead in design and innovation, in pursuit of the easiest and the quickest way to sew clothes, curtains, tablecloths and anything that can be sewn for more than 140 years now. With the advancement of technology, they also create new machine designs and style which other sewing machine companies follow outright. They develop ideas that are meant to make sewing easier, in a large or small scale. You do not have to worry how to sew curtains or bed sheets on your own, or to repair these. Pfaff sewing machines have large sewing plates for your convenience. You can also choose what stitch you would use, because with the Pfaff sewing machines, you just have to push an icon on their touch screen monitors. They intelligent features of these sewing machines also include detection if you are already at the end part of the cloth. The foot pedal would stop upon detection of thread snap too. There is an automatic thread snipper that would know when to cut the bobbin and the top of your thread. 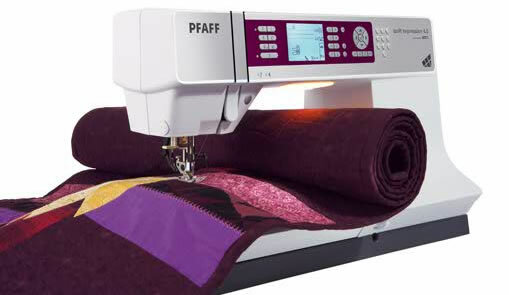 If you are into quilting, you can also use the Pfaff sewing machines to do your thing. You do not have to worry about redoing stitches because of evenness, since the sewing machine is an accurate machine that you can use. It can also penetrate through several layers of cloth. The machine also includes a software, in which you can create design on your computer and apply these on your sewing jobs. This also includes a 1GB memory card, in which you can save your designs and redo these designs over and over again. If you are into business, you can also post your designs in your own website or social networking sites for promotion. Pfaff sewing machines like the Pfaff Select are truly wonderful pieces. It will not be long before they would release new products to add on their long line of wonderfully made sewing machines. And there would be many hopeful women who would want to get one of these things.